Where has our beautiful weather gone??? I suppose we should know better, we are British after all, but we all long for the hot barmy summer days to come. The woods are full of bluebells and everywhere is looking green, lush and alive. I have just potted up and planted out the cuttings that I took from my huge scented geranium earlier in the year. Taking tips from Google, I didn’t really think that they would grow, but they did and now I have some lovely new little plants. 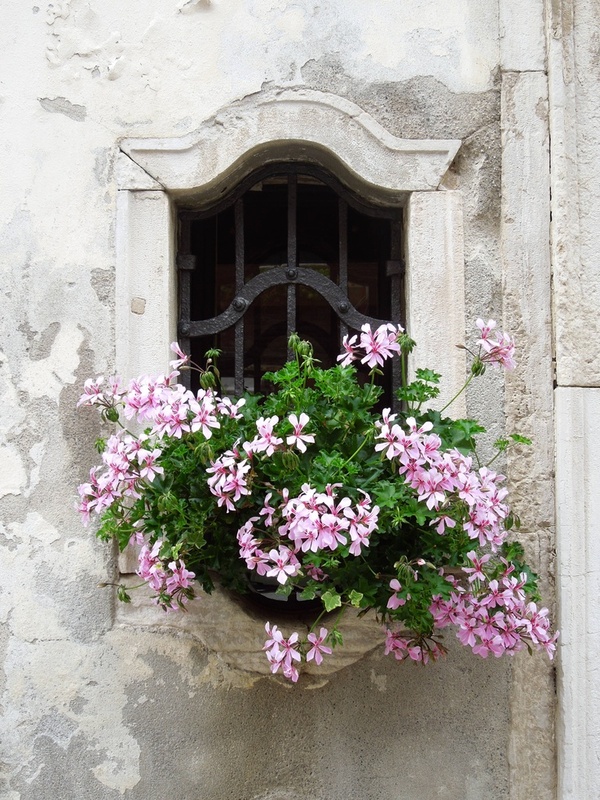 There are many many types of Geraniums, not all are edible, but I love them all, they represent Summer to me and I just love the smell, its so uplifting. I only have the one at the moment, but I have been doing some research and there are so many scents to choose from, apricot, lemon, pine, the list is endless. So I am thinking about starting a collection of my favourite scents and doing some experiments, just think of the gorgeous flavoured sugars, syrups and infused milks you could make. Growing your own you can guarantee that they are organic, have not been sprayed and you can help yourself when ever you want. 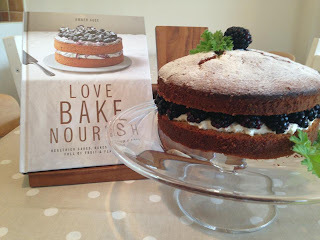 I used mine to make this gorgeous Blackberry and Rose Geranium Cake from my favourite book of the moment, Love Bake Nourish by Amber Rose, I know I need to move on now, especially as my new book ‘Brighton Bakes’ arrived in the post yesterday, but I have not quite had my fill of baking from this scrumptious book. I decided to bake this cake in particular, firstly as I had my lovely friend Andrea coming over for a coffee and I had treated myself to some beautiful new little cake forks and couldn’t wait to give them a try, but in only a few months the blackberries will be in our hedgerows and this cake will come into its own. 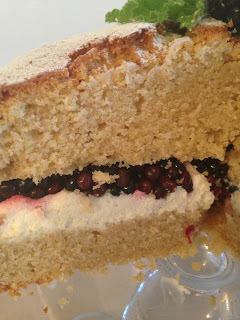 Shop brought blackberries are never the same as the smaller sweeter ones you forage from the hedgerows, purple stained hands and mouths, where you couldn’t resist eating them as you go, in my case, more in my tummy than the pot sometimes! I am already thinking about adaptions, how about blackberry with elderflower syrup, with the cake decorated with elderflowers and served with some homemade elderflower champagne. Sounds heavenly to me. I love being inspired by a book like ‘Love Bake Nourish’, you start by working with the recipes as they are in the book, then after a while you find yourself thinking, what if I just did that, or used this ingredient or flavour, you soon come up with your own renditions, sometimes out of choice, or as in he case of my spiced fairy cakes just because you don’t have the necessary ingredients to hand. 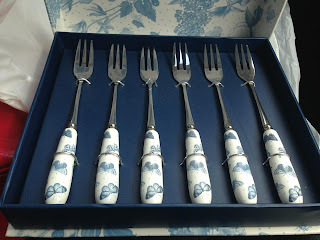 How ever you interpret a recipe, its nice to make it your own. Make the syrup the day before you want to eat the cake. Place 3 of the chopped geranium leaves, the honey and lemon juice in a small saucepan. Bring to the boil, then lower the heat and simmer until reduced to about 2–3 tablespoons. Remove from the heat and allow to cool. Taste and add the extra leaf if you like. Leave to infuse overnight, then strain. Please don’t do what I did, I completely forgot to add the syrup!!! So I had to dismantle the cake and add it, not ideal as the cake didn’t absorb it as well as it would of done if it was still warm. Silly me! Preheat the oven to 180C. Grease and flour a 20cm loose-bottomed cake tin. In a large mixing bowl, cream the butter with an electric hand mixer, add 2–3 tablespoons of the flours, beat briefly, then add the eggs, one at a time, and beat for a further minute or until the mixture is light and fluffy. Mix in the vanilla extract and maple syrup. Add the remaining flours, the baking powder and cornflour, folding gently to combine. 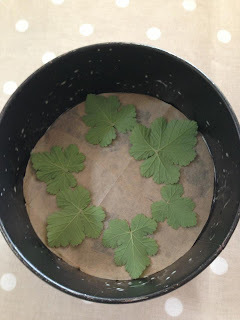 Arrange the whole geranium leaves in the bottom of the prepared tin. Scrape in the cake mixture, level the surface and bake in the oven for 50 minutes, or until the centre springs back to the touch. Remove from the oven and leave to cool in the tin. 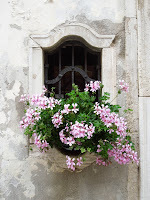 The gentle aroma of geranium as you open the oven door is gorgeous. Gently turn the cooled cake out of the tin and place upside down on a board or plate. Carefully peel off the leaves and discard. To make the filling, whip the cream to ribbon consistency, add the vanilla extract and honey and fold in carefully, do not overmix. Slice the cake in half horizontally; use a skewer to prick holes in the top of each layer and then pour over the syrup (I must remember to do this next time). 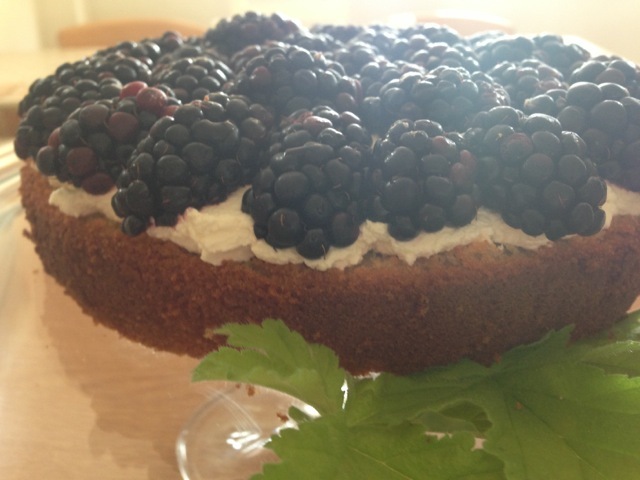 Place the bottom layer on a pretty serving plate or cake stand, spread the cream over the top and sprinkle two thirds of the blackberries over the cream. Or in my OCD case, organise neatly, LOL ! Press the other cake layer on top, dust with icing sugar, if you wish, and decorate with the remaining blackberries and geranium leaves and flowers. Stunning! Now serve on your prettiest plates, with your favourite cup of tea, grab a friend and have a good old natter. Bring a little sunshine into your home, even if it is cold and raining outside.